Anaconda Navigator is a graphical user interface to the conda package and environment manager. This 10-minute guide to Navigator will have you navigating the powerful conda program in a web-like interface without having to learn command line commands. SEE ALSO: Getting started with conda to learn how to use conda. Compare the Getting started guides for each to see which program you prefer. From the Start menu, click the Anaconda Navigator desktop app. Or from the Start menu, search for and open “Anaconda Prompt” and type the command anaconda-navigator. Open Launchpad, then click the Anaconda-Navigator icon. Or open Launchpad and click the terminal icon. Then in terminal, type anaconda-navigator. Open a terminal window and type anaconda-navigator. Verify that Anaconda is installed and running on your system. When Navigator starts up, it verifies that Anaconda is installed. 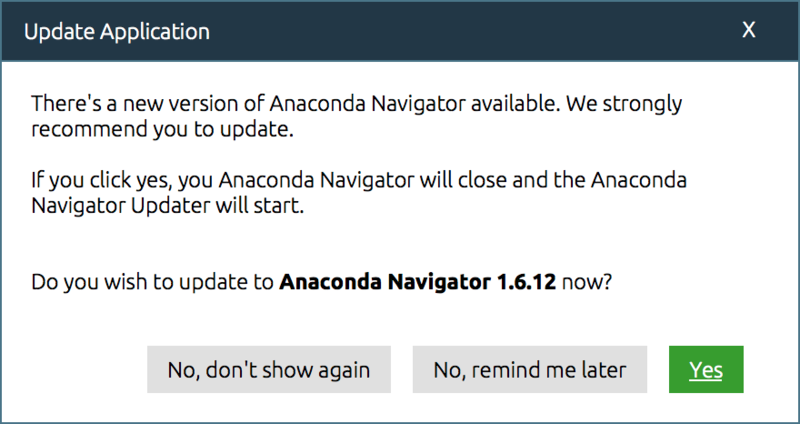 If Navigator does not start up, go back to Anaconda installation and make sure you followed all the steps. Check that Navigator is updated to the current version. Click the “Yes” button to update Navigator to the current version. We recommend that you always keep Navigator updated to the latest version. Navigator uses conda to create separate environments containing files, packages, and their dependencies that will not interact with other environments. In Navigator, click the Environments tab, then click the Create button. The Create new environment dialog box appears. In the Environment name field, type a descriptive name for your environment. Click Create. Navigator creates the new environment and activates it. Now you have two environments, the default environment base (root), and snowflakes. Switch between them (activate and deactivate environments) by clicking the name of the environment you want to use. The active environment is the one with the arrow next to its name. Return to the other environment by clicking its name. When you create a new environment, Navigator installs the same Python version you used when you downloaded and installed Anaconda. If you want to use a different version of Python, for example Python 3.5, simply create a new environment and specify the version of Python that you want in that environment. In Navigator, click the Environments tab, then click the Create button. The Create new environment dialog box appears. In the Environment name field, type the descriptive name “snakes” and select the version of Python you want to use from the Python Packages box (3.6, 3.5 or 2.7). 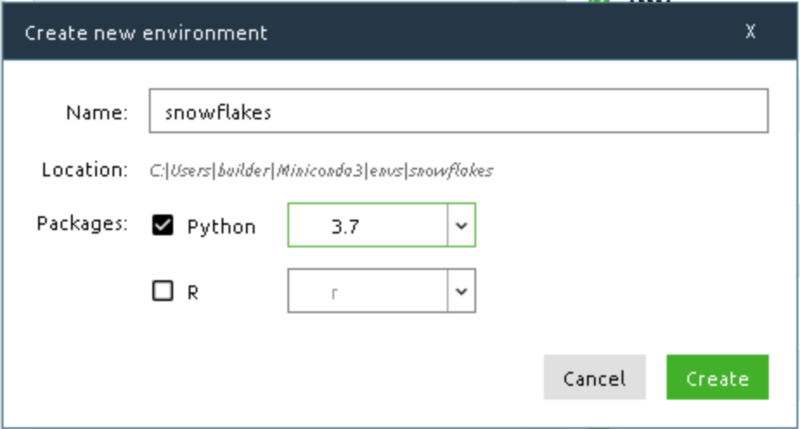 Select a different version of Python than is in your other environments, base or snowflakes. Activate the version of Python you want to use by clicking the name of that environment. In this section, you check which packages you have installed, check which are available, and look for a specific package and install it. To find a package you have already installed, click the name of the environment you want to search. The installed packages are displayed in the right pane. You can change the selection of packages displayed in the right pane at any time by clicking the drop-down box above it and selecting Installed, Not Installed, Updateable, Selected, or All. 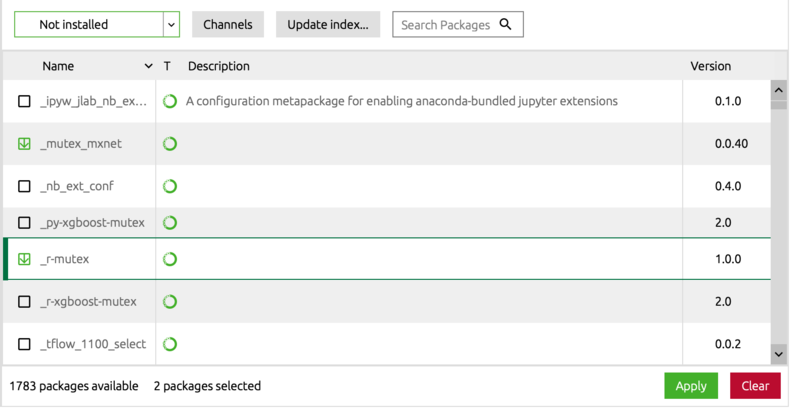 Check to see if a package you have not installed named “beautifulsoup4” is available from the Anaconda repository (must be connected to the Internet). On the Environments tab, in the Search Packages box, type beautifulsoup4, and from the Search Subset box select All or Not Installed. To install the package into the current environment, check the checkbox next to the package name, then click the bottom Apply button. The newly installed program is displayed in your list of installed programs.